The Palestinian Center for Human Rights (PCHR) condemns the killing of Journalist Ahmed Mohammed Ashraf Hasan Abu Hussein (24), a reporter for al-Sha’ab Radio, on Wednesday, 25 April, after succumbing to his wounds he sustained by the Israeli forces when covering the clashes of March of Return and Breaking the Siege on Friday, 13 April 2018, in northeastern Jabalia. This is the second journalist to have been killed by the Israeli forces during the March of Return and Breaking the Siege demonstrations which started on 30 March 2018 as the Israeli forces previously killed journalist Yasser Murtaja, a photojournalist in ‘Ein Media News Agency, east of Khan Younis, on 07 April. During the reporting period, PCHR monitored that 31 journalists, including 4 female journalists, were directly wounded with live and rubber bullets and tear gas canisters. Among those journalists wounded was Yousif al-Kronz, Reporter for al-Wataniya New Agency, whose leg was amputated, and others who were in serious condition after being hit by the snipers with explosive bullets, particularly in the waist, in order to harm them severely. PCHR emphasizes that targeting journalists is a crime under the international law and international humanitarian law and what happened is part of the Israeli adopted policy, which has been monitored by PCHR for decades, to silence the press, conceal the truth, and absent the other narrative that reveals the Israel forces’ crimes against the Palestinian people. Thus, PCHR condemns targeting journalists and peaceful demonstrators and confirms exerting persistent efforts to prosecute Israeli murderers and war criminals. According to PCHR’s investigations, Journalist Abu Hussein was hit with a bullet under the left armpit when he was covering the incidents in the border fence area between the Gaza Strip and Israel in eastern Abu Safiyah Hill, northeast of Jabalia in the northern Gaza Strip. Journalist Abu Hussein was wounded though he was wearing the PRESS-marked vest and TV-marked helmet. His condition was serious and he was admitted to the Indonesian Hospital. Due to his deteriorating health condition, he was referred to the West Bank hospitals to receive medical treatment and then to Tel HaShomer Hospital in Israel, where he stayed in the Intensive Care Unit (ICU) until his death was declared yesterday. Targeting journalists, despite all the distinctive signs that emphasize the nature of their work, and even the Israeli forces’ intentionally targeting the demonstrators in the upper side of their bodies undoubtedly confirms that the Israeli soldiers had orders or at least a permission to inflict casualties and deter journalists from covering these crimes as well. 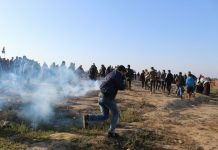 PCHR emphasizes that the rules of the international human rights law should be applied when dealing with the peaceful demonstrations along the Gaza Strip borders. Therefore, PCHR stresses that Israel should be obliged to the international standards relevant to the use of force and firearms by law enforcement officials. Rules of firearm use stipulate that soldiers should not use live fire unless their life is under imminent threat and the shooting must be gradual and proportionate with the threat. First, the soldiers shall give a warning and not in any case use live bullets, except as a last option to defend themselves or others in cases of imminent danger aiming at hindering the attacker’s movement and not killing him. According to PCHR’s follow-up and several international reports, the facts on the grounds confirms that no threat was posed to life of the soldiers who were standing hundreds of meters away from the demonstrators and separated by three security fences and fortifications with a huge sand barriers and personal shields. This confirms the absence of any possibility of a real threat to the soldier’s lives. Moreover, PCHR’s follow-up of the targeting and injuries confirms that the Israeli soldiers used the shoot-to-kill policy against the demonstrators, and this can be clarified from the places of injuries; many of which were in the head and upper part of the body. PCHR calls upon the international community to take immediate action in order to force Israel to stop their crimes against the Palestinian people. 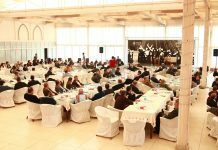 PCHR stresses the important role of the European Union (EU) in promoting the protection of human rights in the Middle East. Thus, PCHR calls upon the EU to activate the Euro-Israeli Association Agreement in order to ensure Israel’s respect for human rights in the oPt. PCHR affirms that any international party providing any military or political assistance in the meantime will be complicit in the crime committed against the Palestinian civilians.